Valentin Bousch (fl. 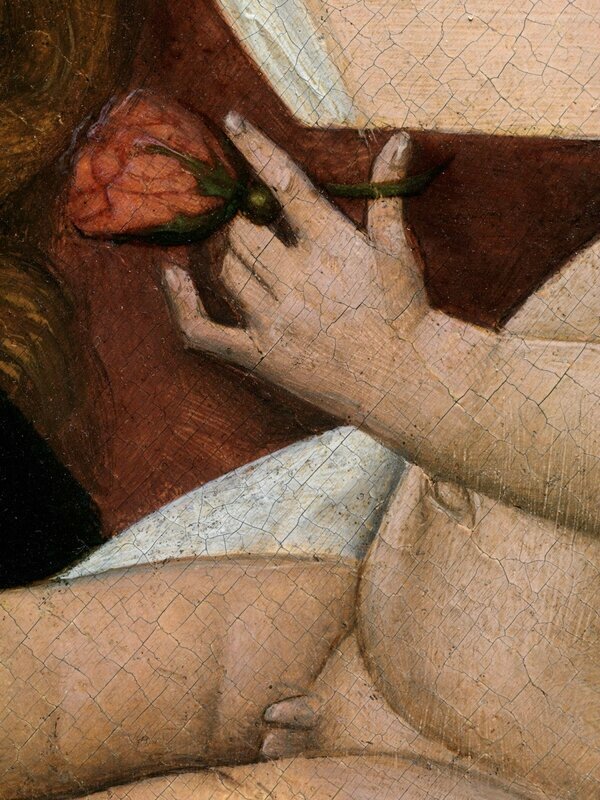 1514-1541), The Creation of the World and the Expulsion from Paradise (detail). Church of Saint Firmin at Flavigny-sur-Moselle, Lorraine. Dated 1533. Stained glass, 114 x 30 inches. © THE ARTISTS AND LUHRING AUGUSTINE. NEW YORK, NY.- Luhring Augustine is presenting Of Earth and Heaven: Art from the Middle Ages, an exhibition of Late Medieval painting, sculpture, stained glass, and goldsmith’s work in association with Sam Fogg, the world’s leading dealer in the art of the Middle Ages. 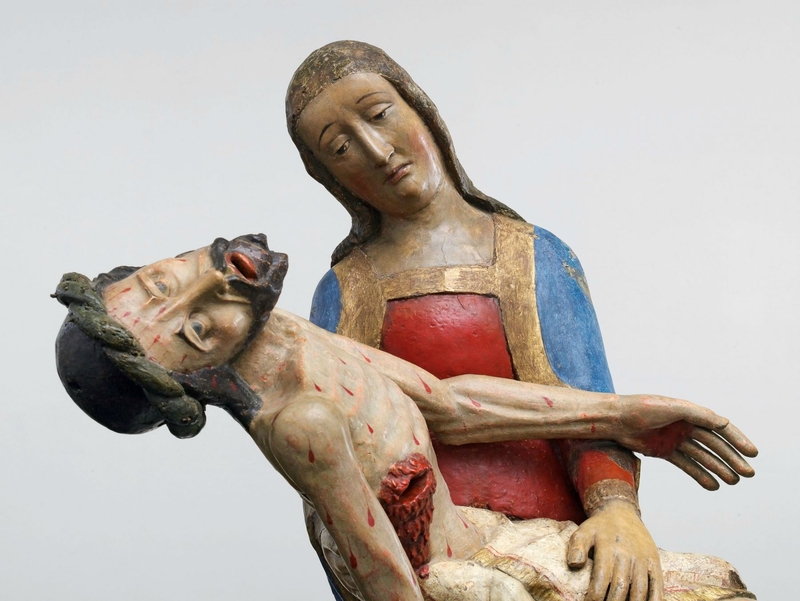 The exhibition will highlight Europe’s artistic flowering between the 12th and 16th centuries, bringing together many of the finest masterpieces of Medieval and Renaissance art still in private hands. 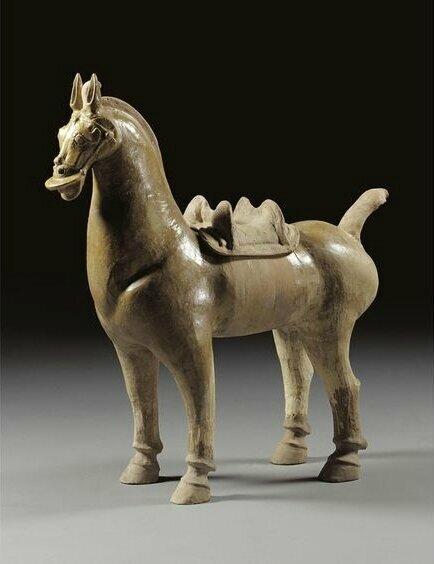 A fully illustrated catalogue has been published in conjunction with the exhibition. 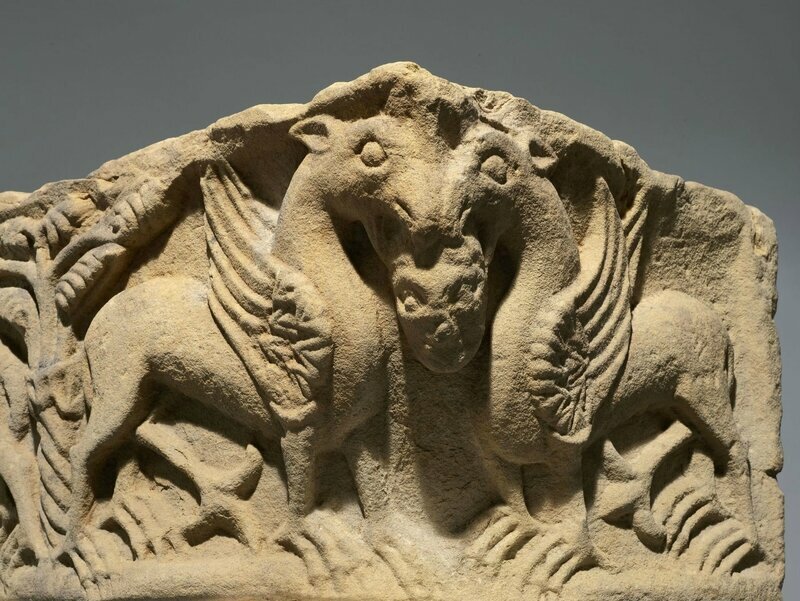 The centerpiece of the exhibition will be three monumental sections of carved stonework from the south transept window of Canterbury Cathedral, one of the most important pilgrimage sites in Europe. The window was designed by Thomas Mapilton (d. 1438), a master mason who worked on Westminster Abbey and the Tower of London prior to his appointment at Canterbury. 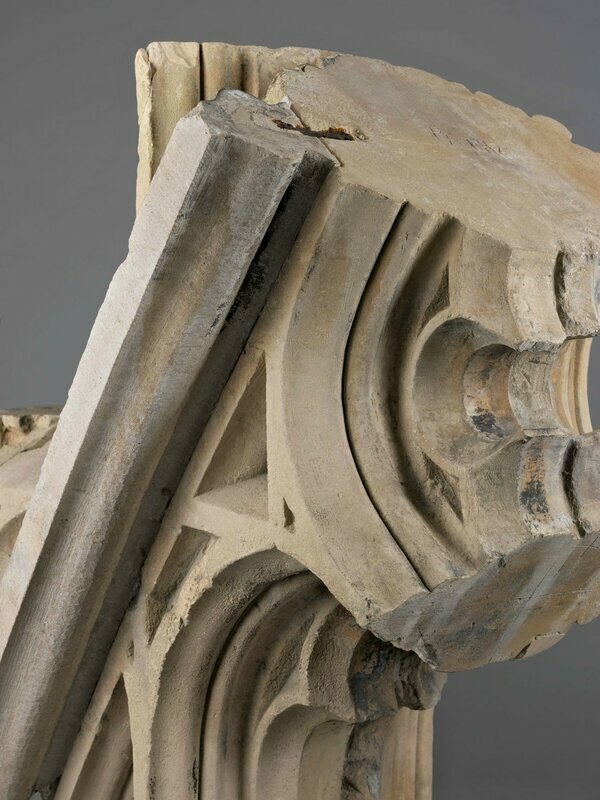 The window, made from limestone specially quarried at Caen in Normandy, France in 1428, was one of the most ambitious projects of English Gothic architecture, filling almost the entire height and width of the cathedral’s vast south transept. A monumental arch intersection, from the south window of Canterbury Cathedral, Canterbury, Kent, England, 1428-33. Caen limestone with contemporary piecing repairs and some late eighteenth-century Portland stone restorations, 33 1/2 x 41 3/8 x 23 7/8 inches (85 x 105 x 60.5 cm) © THE ARTISTS AND LUHRING AUGUSTINE. A monumental arch intersection, from the south window of Canterbury Cathedral (detail), Canterbury, Kent, England, 1428-33. 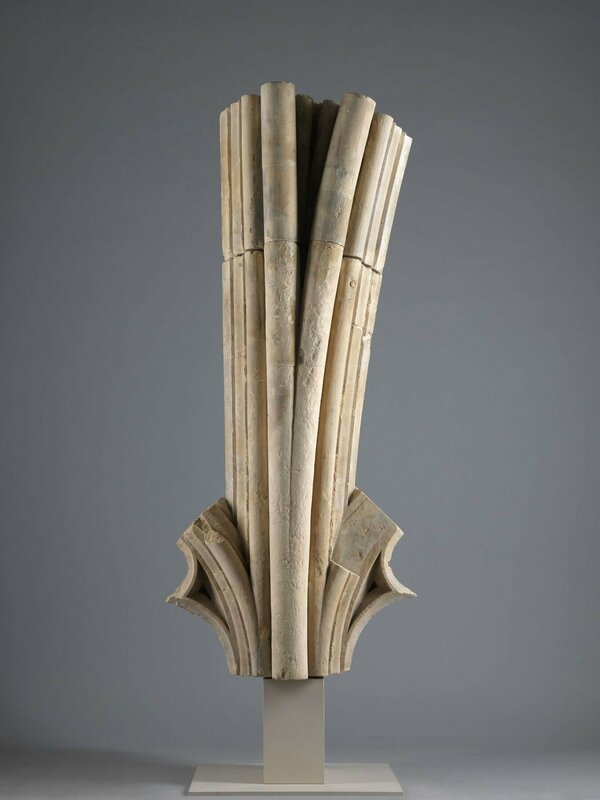 Caen limestone with contemporary piecing repairs and some late eighteenth-century Portland stone restorations, 33 1/2 x 41 3/8 x 23 7/8 inches (85 x 105 x 60.5 cm) © THE ARTISTS AND LUHRING AUGUSTINE. A springer mullion from the south window of Canterbury Cathedral, Canterbury, Kent, England, 1428-33. 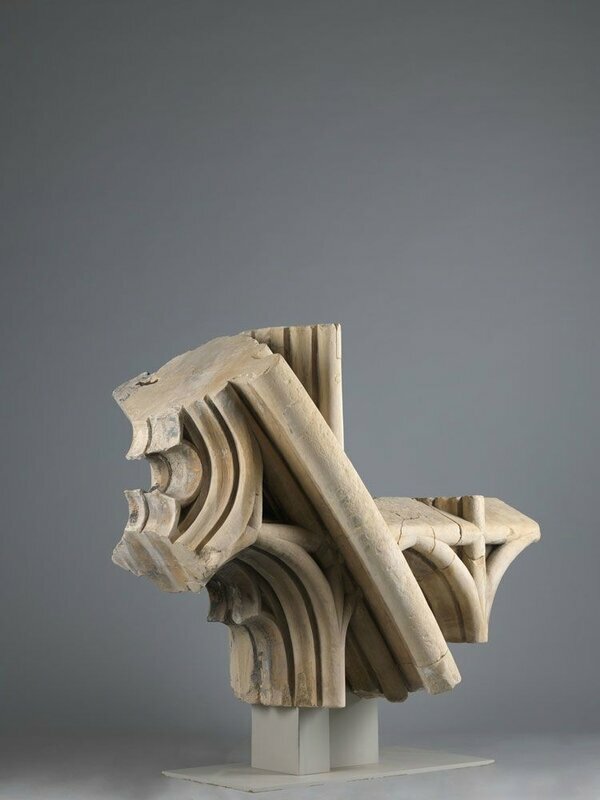 Caen limestone in two parts, both with 1930s' Doulting stone repairs, 57 1/8 x 25 3/8 x 25 5/8 inches (145 x 65 x 65 cm) © THE ARTISTS AND LUHRING AUGUSTINE. 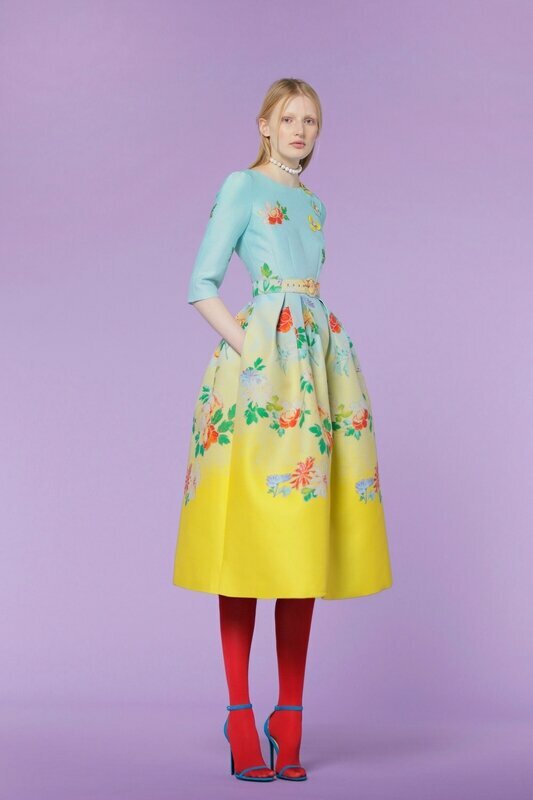 The exhibition will also feature a carefully selected group of paintings, sculptures, and goldsmith’s work. 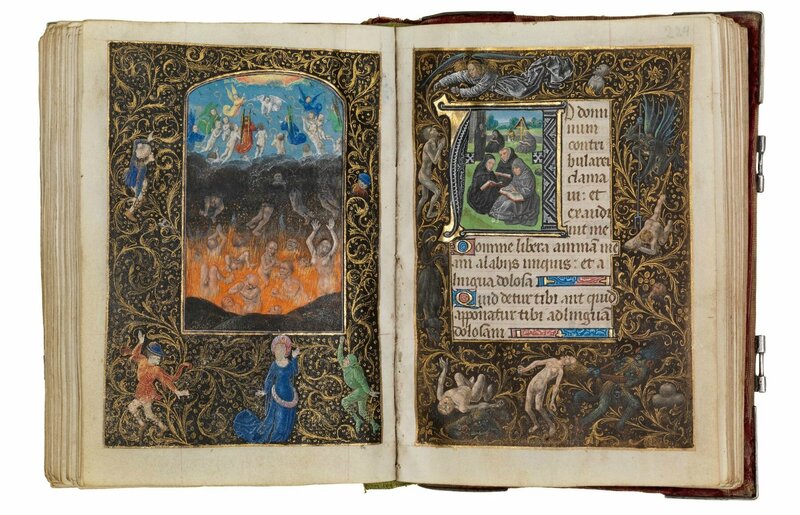 Highlights will include an extraordinary stained-glass window depicting the Creation of the World and the Expulsion of Adam and Eve from the Garden of Eden, painted in 1533 by the celebrated Renaissance glass-painter Valentin Bousch. 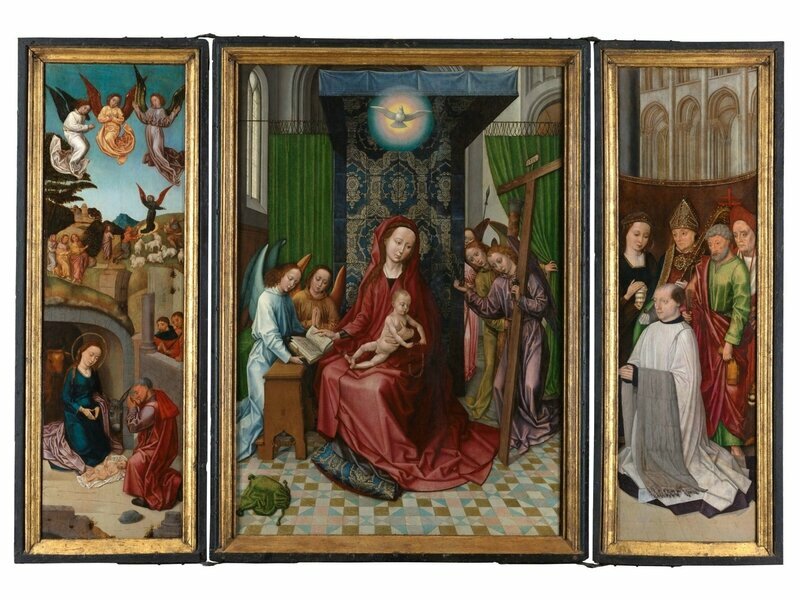 There will also be one of the most significant Netherlandish paintings to emerge onto the market in decades: a large painted triptych dedicated to the Virgin and Child which retains its wings and original frame. 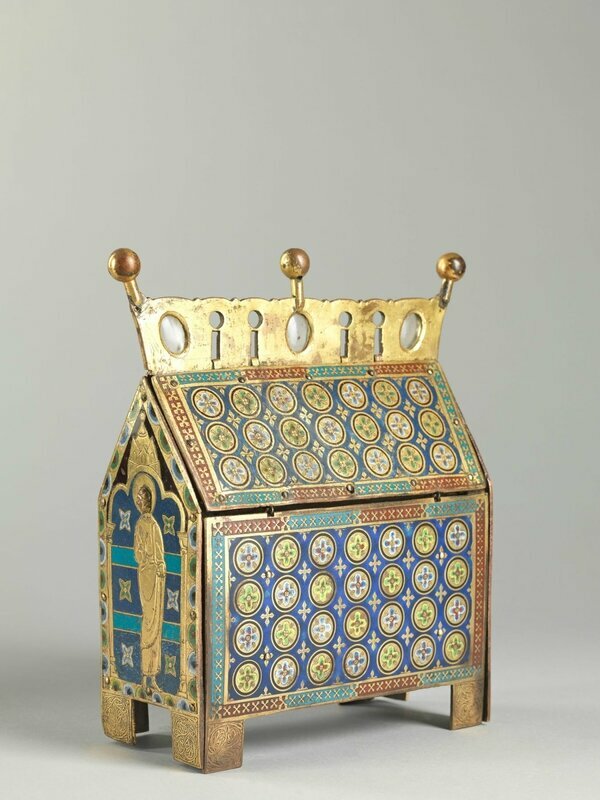 Among the small-scale treasury objects to be presented is a precious 13th-century Limoges reliquary chasse, outstanding in its nearly pristine gilded decoration. Valentin Bousch (fl. 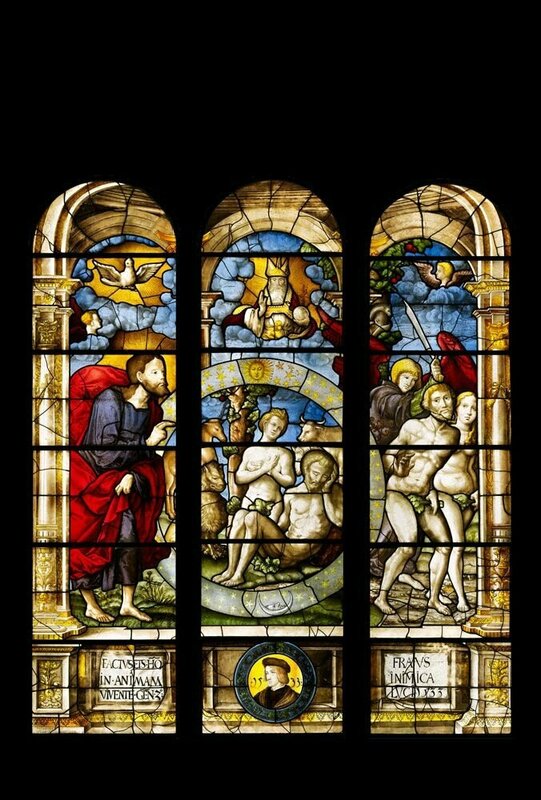 1514-1541), The Creation of the World and the Expulsion from Paradise, Church of Saint Firmin at Flavigny-sur-Moselle, Lorraine. Dated 1533. 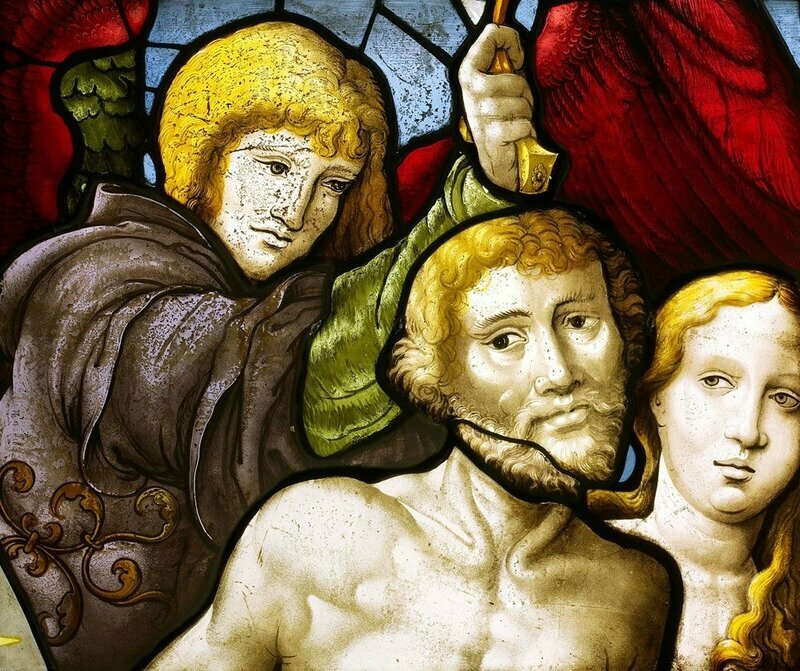 Stained glass, 114 x 30 inches (289.56 x 76.2 cm) © THE ARTISTS AND LUHRING AUGUSTINE. 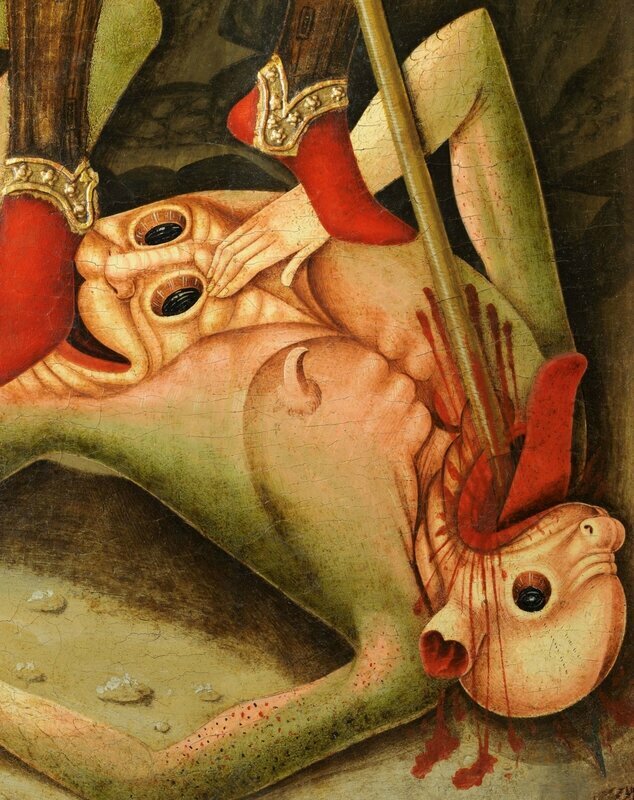 The Master of 1499 (Ghent or Brussels, fl. 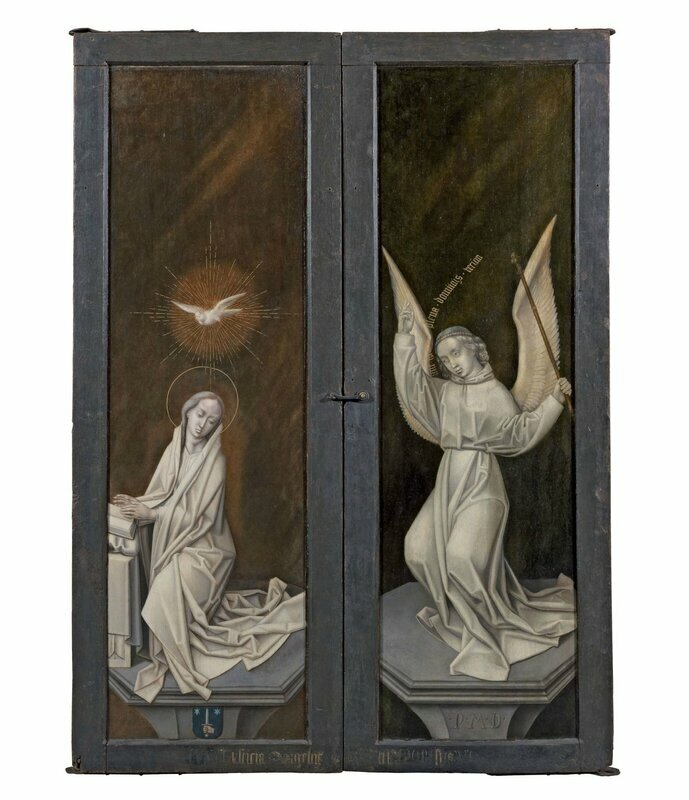 c. 1490-c. 1520), Outer wings of the Triptych of the Virgin and Child depicting the Annunciation of the Virgin, South Netherlands, c. 1490-1500. Oil and gilding on oak panel with the original frames. Fully opened: 46 1/4 x 67 inches (117.5 x 170 cm). Closed: 46 1/4 x 33 1/2 inches (117.5 x 85.2 cm) © THE ARTISTS AND LUHRING AUGUSTINE. 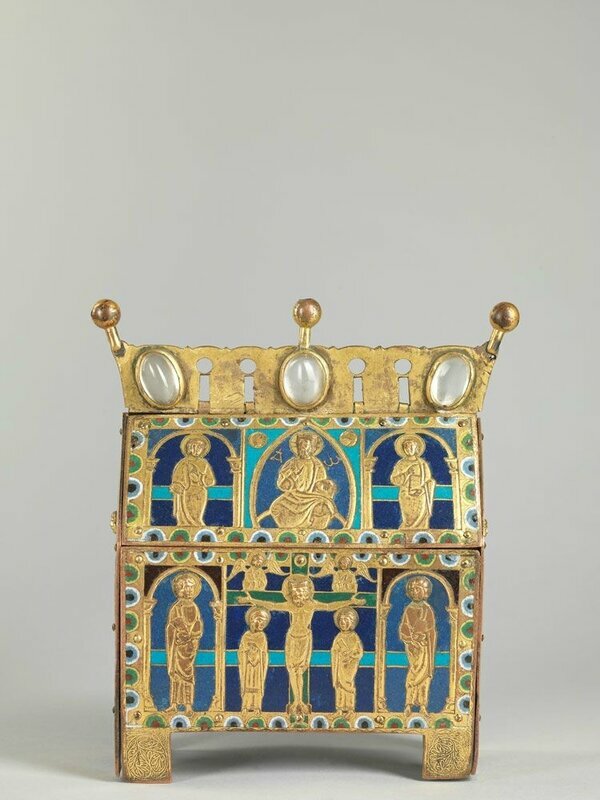 An enameled casket showing the Crucifixion, Limoges, France, c. 1200. 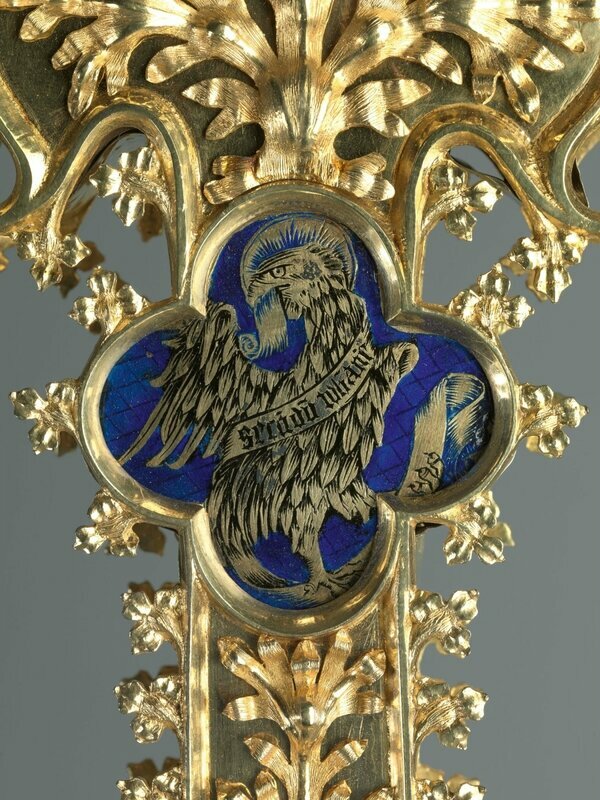 Champlevé enamel and rock crystal on gilt copper alloy over modern oak core, 8 1/2 x 6 1/2 x 3 1/8 inches (21.5 x 16.5 x 7.8 cm) © THE ARTISTS AND LUHRING AUGUSTINE. Sam Fogg’s experience with the finest Spanish art of the Middle Ages will also be highlighted with a life-size corpus of Christ in carved and polychromed wood, and a massive panel painting of Saint Christopher by the Valencian painter Nicolás Falcό, measuring over nine feet in height. 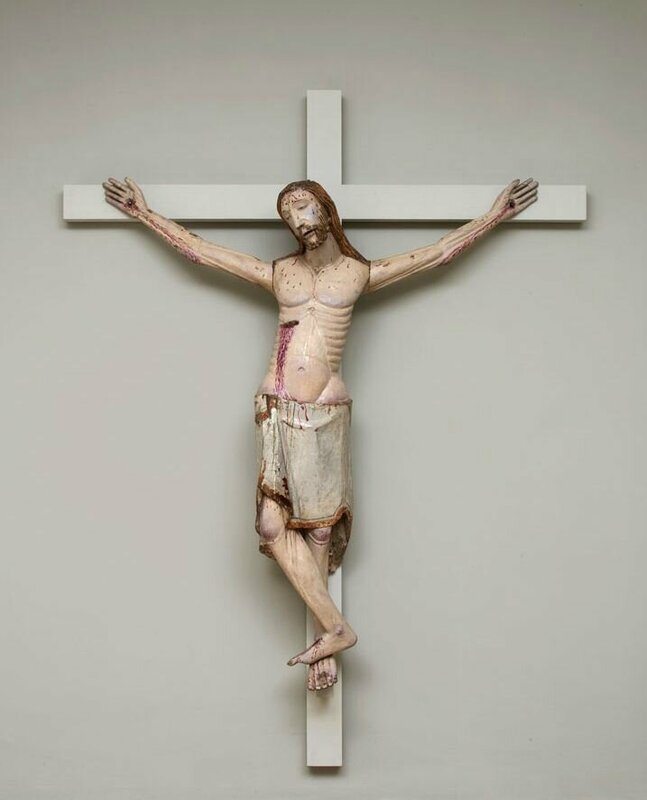 A life-sized polychromed corpus of Christ, Aragón, North-eastern Spain, 13th century. Polychromy and gilding on softwood, 61 3/4 x 61 x 10 1/4 inches (157 x 155 x 26 cm) © THE ARTISTS AND LUHRING AUGUSTINE. 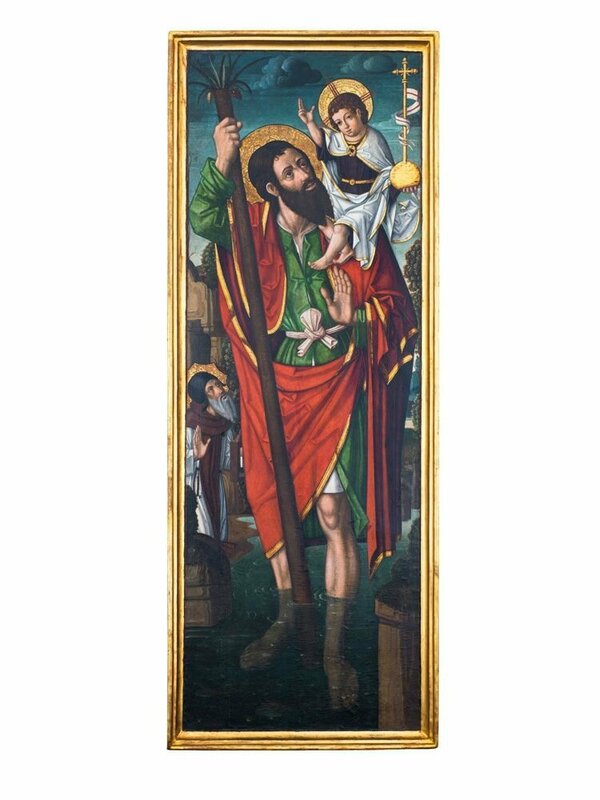 Nicolás Falcó (c. 1470-1531), Saint Christopher carrying the Christ Child, Spain, Valencia, c. 1510-20. Oil and gilding on softwood panel, in an applied gilded frame, 124.8 x 47.64 x 4.72 inches (317 x 121 x 12 cm) © THE ARTISTS AND LUHRING AUGUSTINE. January 27 – March 10, 2018. 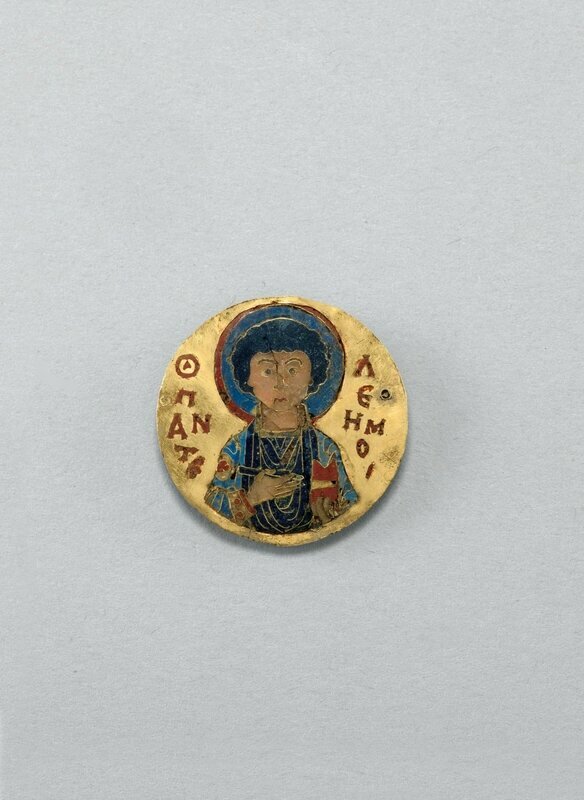 Cloisonné enamel medallion showing Saint Pantaleon, Constantinople, Late 11th or early 12th century. Cloisonné ename on gold sheet, 1 inch (2.6 cm) diameter © THE ARTISTS AND LUHRING AUGUSTINE. 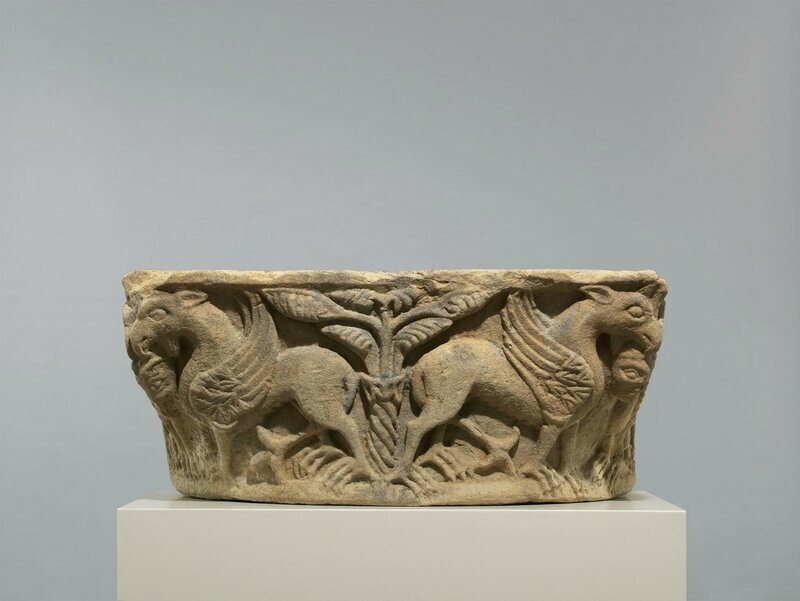 Capital with griffins, Apulia, Italy, c. 1150. 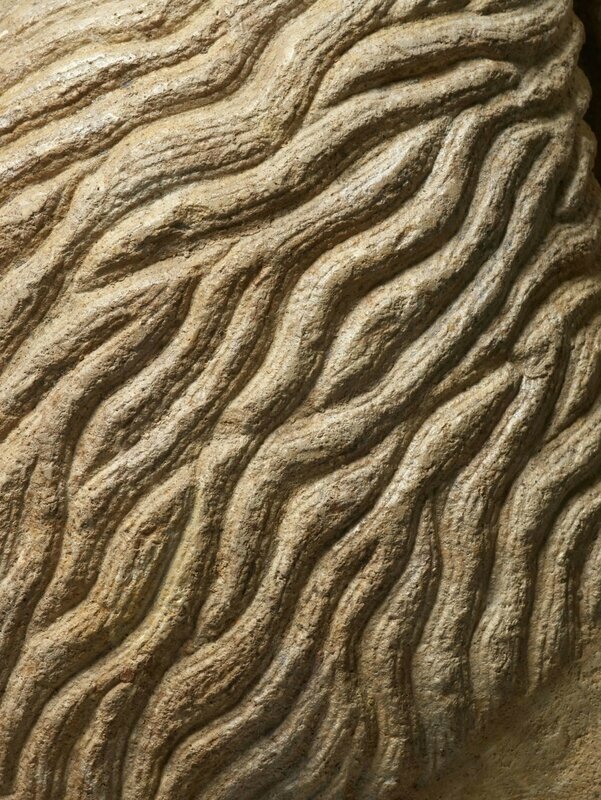 Sandstone, 14 1/2 x 34 x 16 inches (37 x 86 x 41 cm) © THE ARTISTS AND LUHRING AUGUSTINE. An enamelled plaque depicting Saint Matthew, from the tomb of Henry I, Cont of Champagne (d. 1181), Troyes Cathedral, Troyes, Champagne, France, c. 1180. 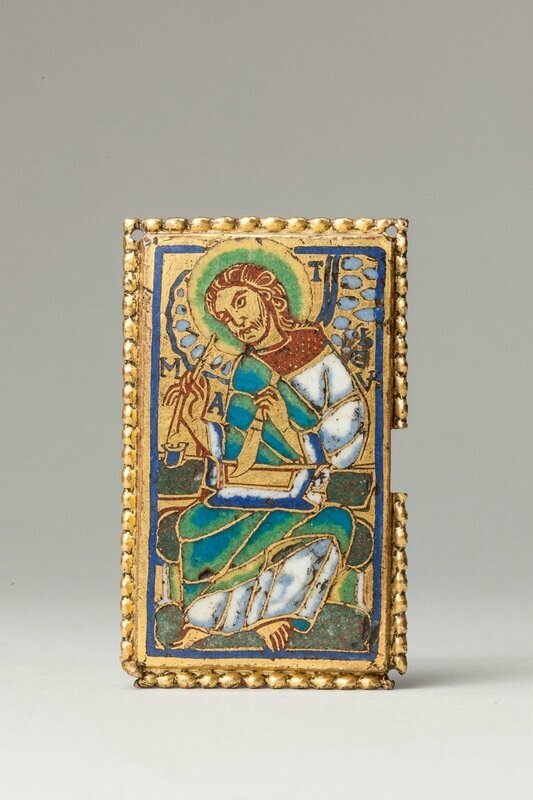 Gilt copper with champlevé enamel, 2 1/2 x 1 1/2 inches (6.2 x 3.8 cm) © THE ARTISTS AND LUHRING AUGUSTINE. 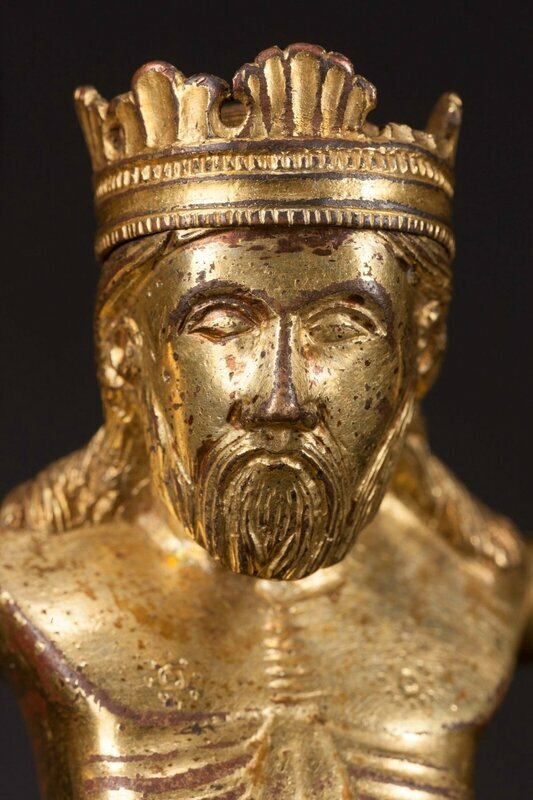 A gilded bronze corupus of Christ Triumphant, Meuse Valley, c. 1200. 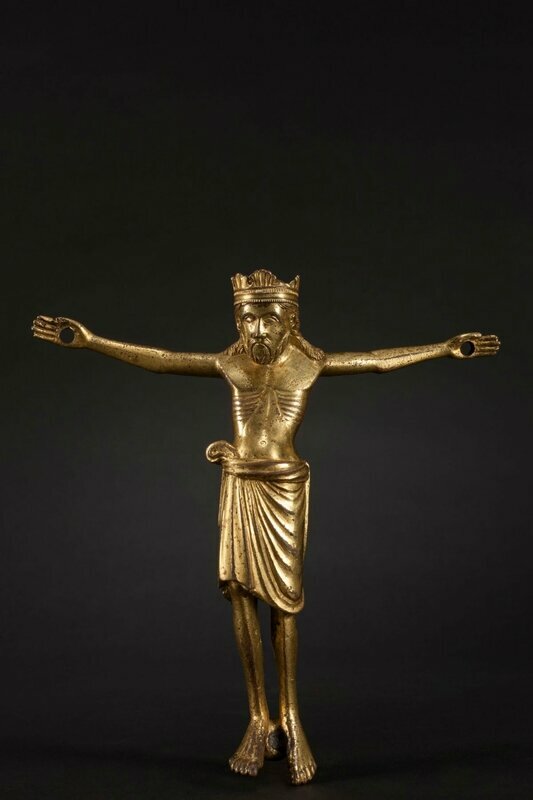 Gilt bronze, 6 7/8 x 7 1/8 x 1 3/8 inches (17.5 x 18.1 x 3.5 cm) © THE ARTISTS AND LUHRING AUGUSTINE. 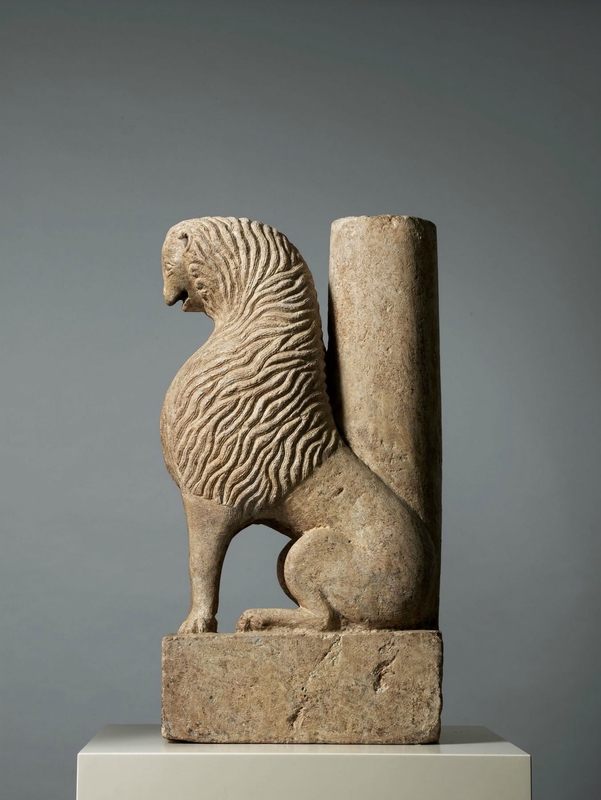 A seated lion, Apulia, Southern Italy, c. 1200. 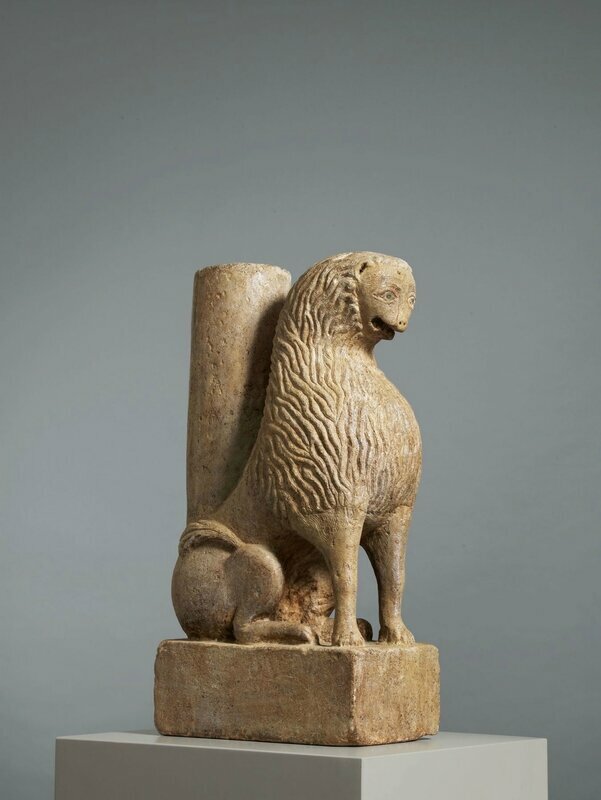 Limestone, lead, 39 3/4 x 14 1/4 x 20 1/2 inches (101 x 36 x 52 cm) © THE ARTISTS AND LUHRING AUGUSTINE. 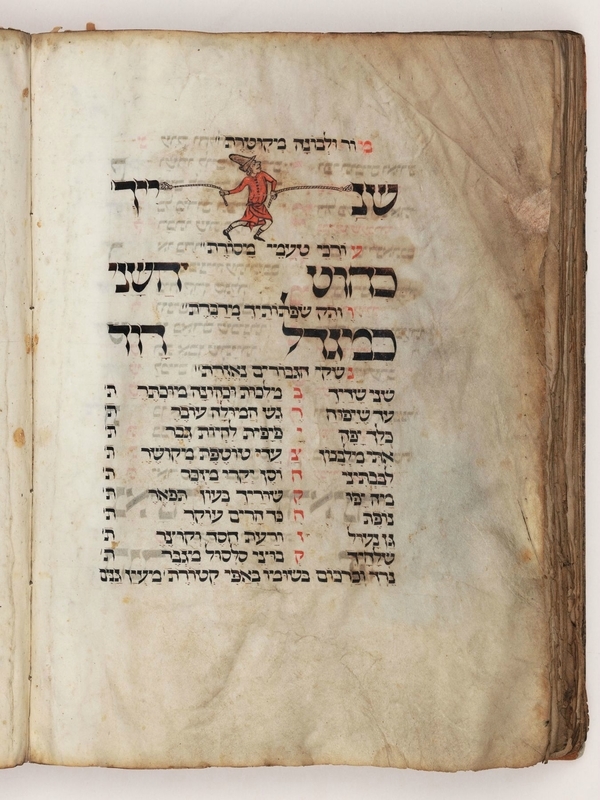 The Montefiore Mainz Mahzor, Mahzor for special Shabbot, Passover, and Shavuot according to the Rie of Mainz, Rhineland, c. 1310-20. 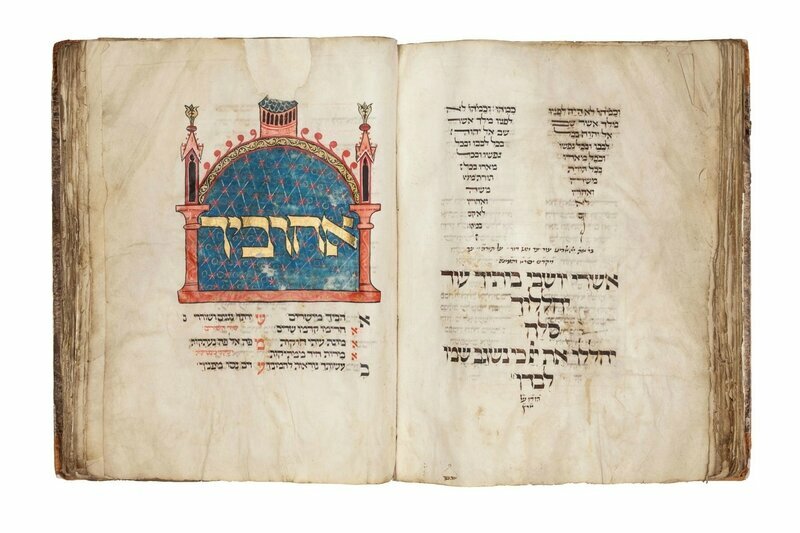 Illustrated manuscript on parchment, 299 leaves, ruled in ink and written in black ink in Ashkenazi script, 15 3/4 x 11 1/2 inches (40 x 29.2 cm) © THE ARTISTS AND LUHRING AUGUSTINE. Robert de Lannoy (fl. 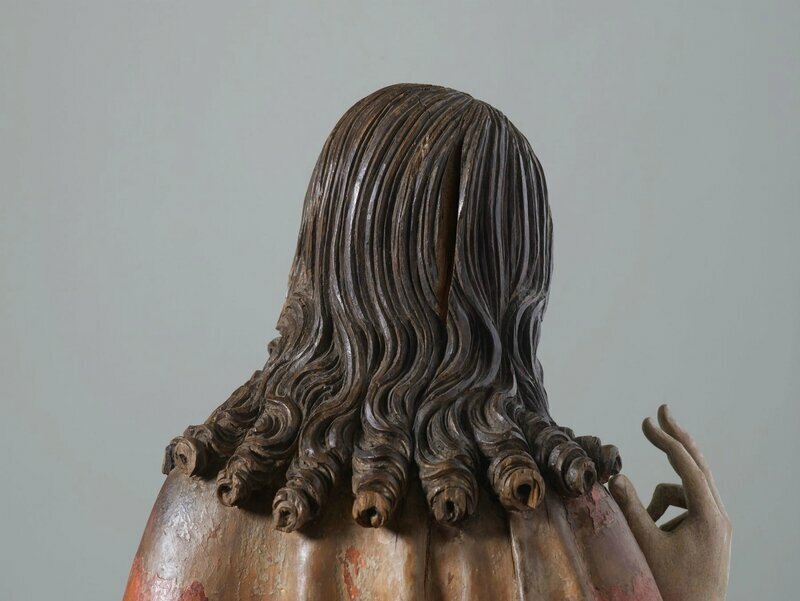 from 1292, d. Paris? 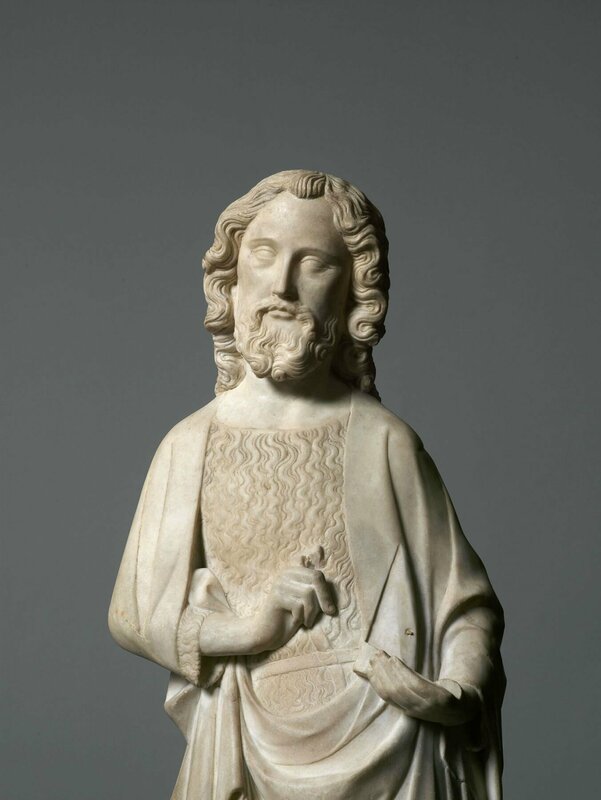 1356, attributed), John the Baptist, Paris, France, c. 1325-30. 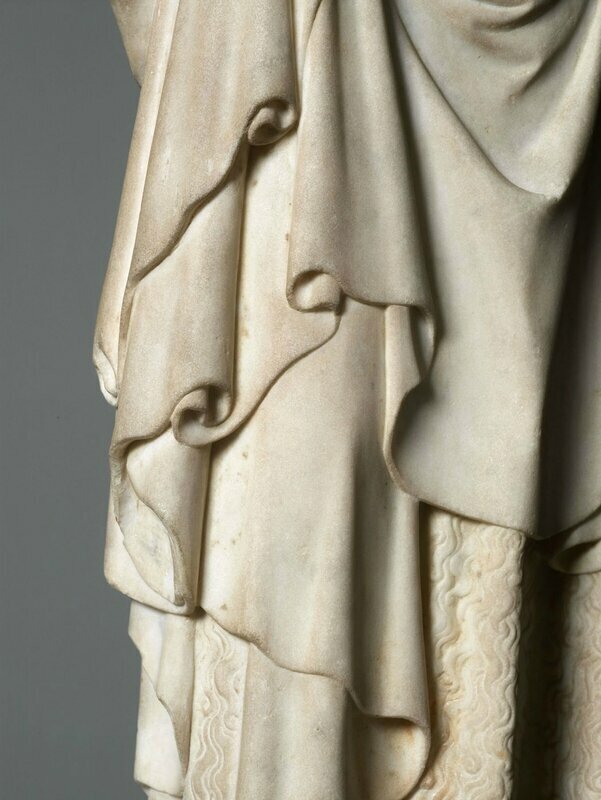 White marble with traces of polychromy, 31 1/8 x 10 1/4 x 4 3/4 inches (79 x 26 x 12 cm) © THE ARTISTS AND LUHRING AUGUSTINE. 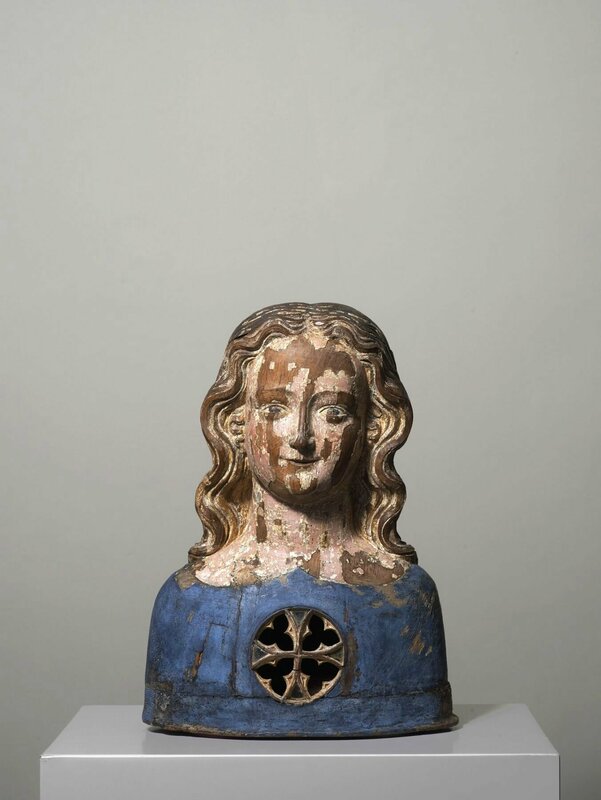 A reliquary bust of one of the 11,000 Virgins, Cologne, Germany, c. 1350. Walnut with remnants of polychromy, 17 1/8 x 12 5/8 x 8 1/4 inches (43.5 x 32 x 21 cm) © THE ARTISTS AND LUHRING AUGUSTINE. 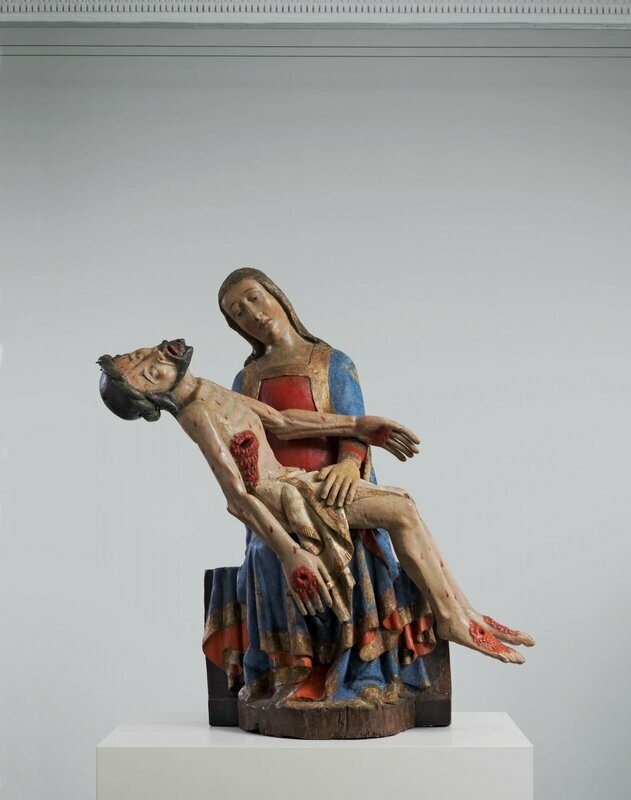 Pietà, Southern Germany, c. 1390. Softwood with gilding and polychromy, 44 x 41 inches (112 x 105 cm) © THE ARTISTS AND LUHRING AUGUSTINE. 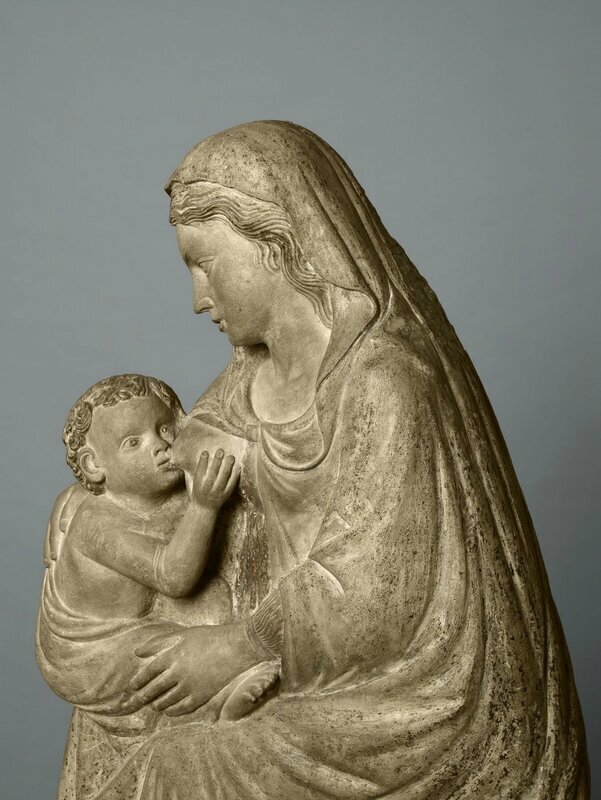 Virgo Lactans (The Nursing Virgin), Lombardy, Italy, c. 1400. 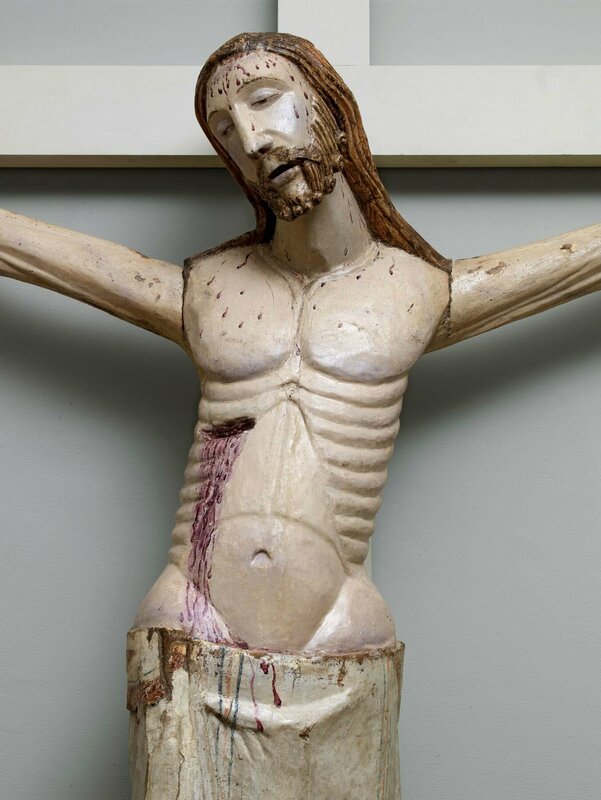 Limestone with traces of polychromy; remains of an iron fixing in the crown of Christ's head, 36 1/4 x 23 1/4 x 8 1/4 inches (92 x 59 x 21 cm) © THE ARTISTS AND LUHRING AUGUSTINE. 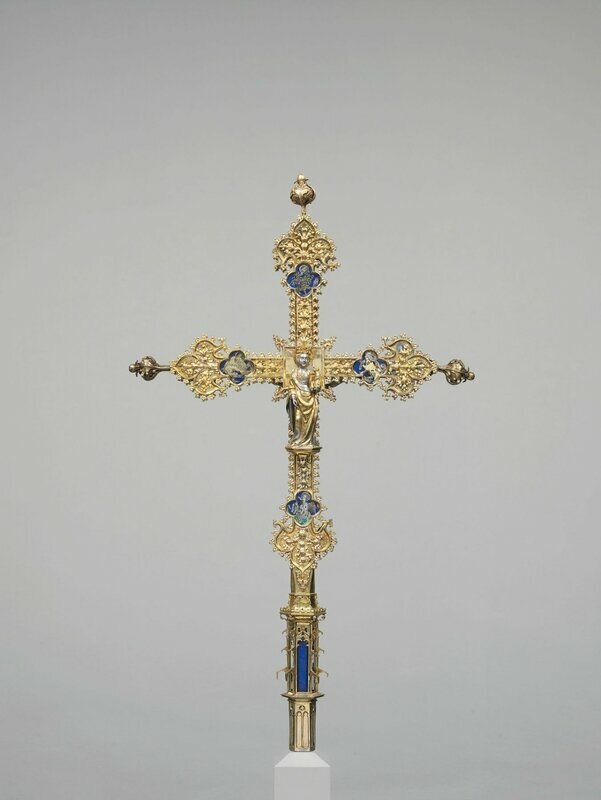 A large processional cross, Barcelona (? 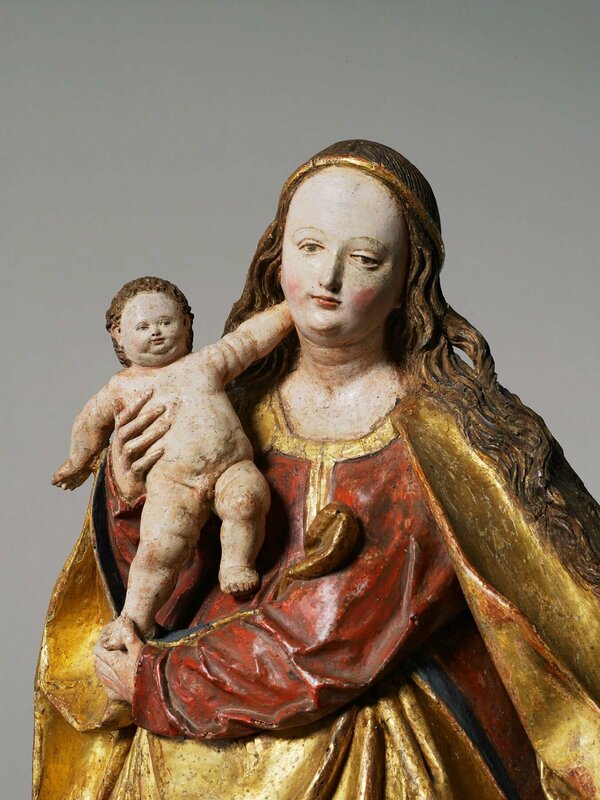 ), Spain, c. 1400. 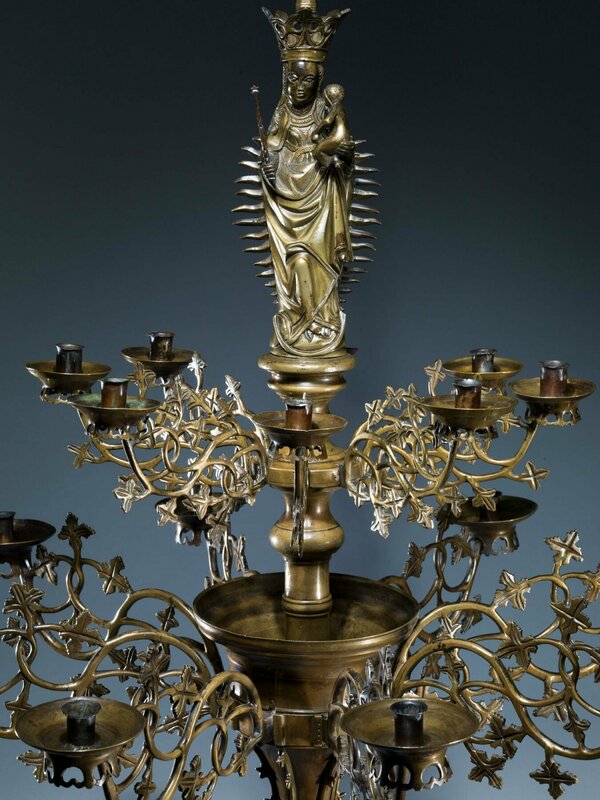 Silver and silver-gilt, with parcel gilt figures and colored enamels, 33 7/8 x 20 1/2 inches (86 x 52 cm) © THE ARTISTS AND LUHRING AUGUSTINE. 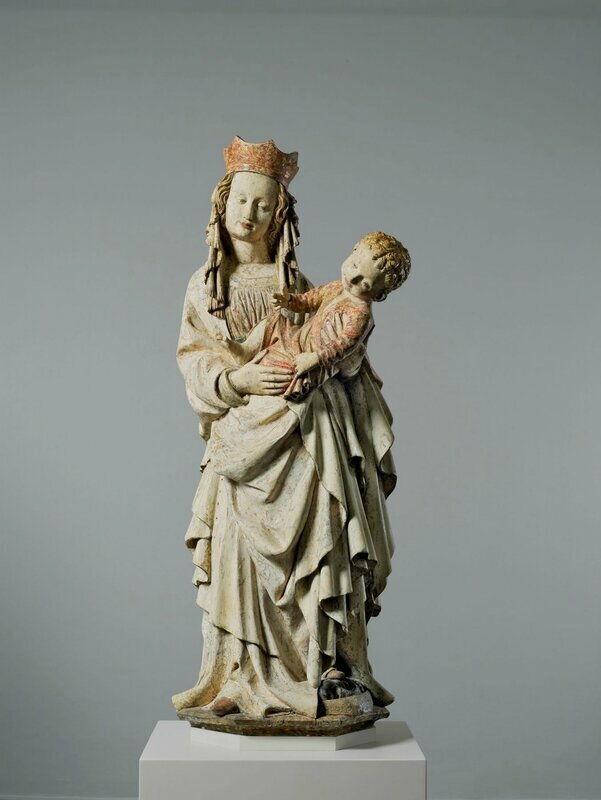 A Schöne ('Beautiful') Madonna, Salzburg, Austria, c. 1430. Softwood with traces of gilding and polychromy, 52 x 20 1/2 x 15 inches (132 x 52 x 38 cm) © THE ARTISTS AND LUHRING AUGUSTINE. Maestro de los Florida (Juan de Bonilla? doc. 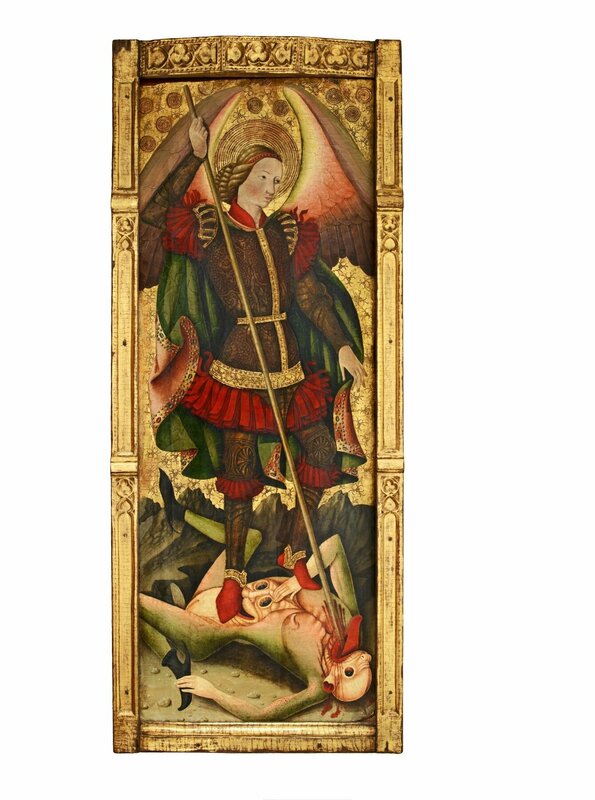 1442-78), Saint Michael Vanquishing the Devil, Aragon: Daroca or Teruel, c. 1470. Tempera and gilded gesso on panel, 58 5.8 x 21 1/2 inches (149 x 54.5 cm) © THE ARTISTS AND LUHRING AUGUSTINE. 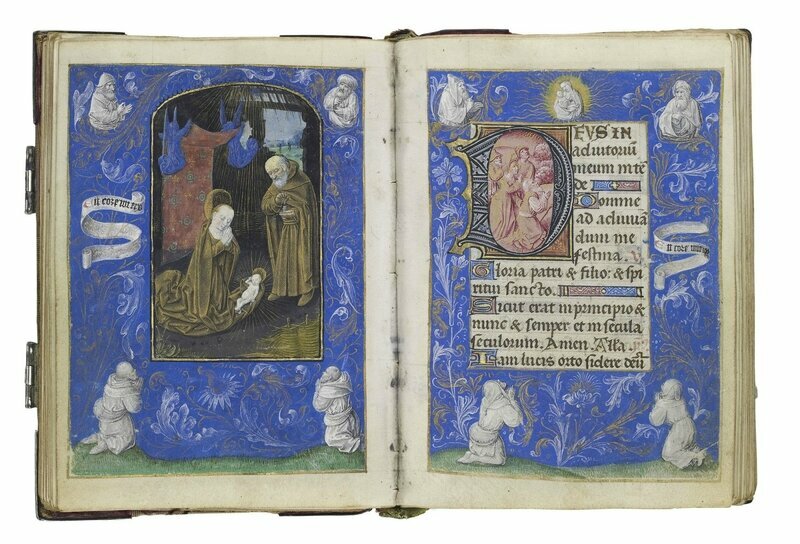 The Master of the Dresden Prayerbook (c. 1465-c. 1515), The Carpentin Hours, Bruges, Netherlands, Mid-1470s. 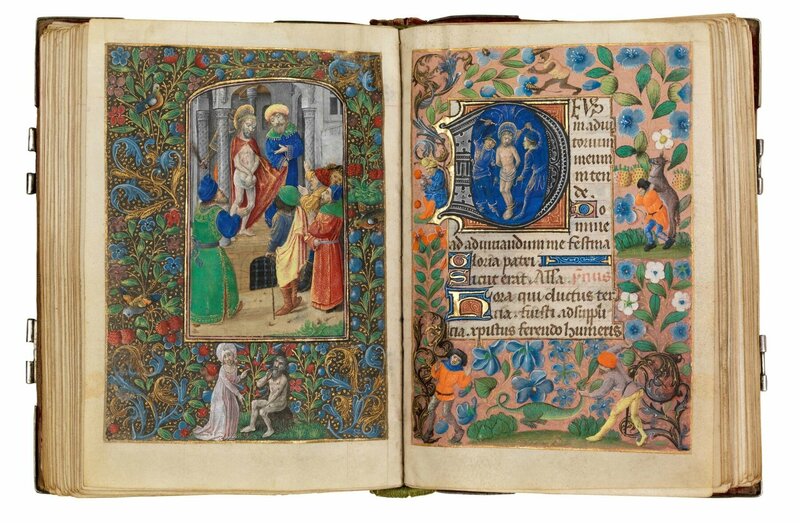 Illuminated on vellum; 300 leaves, with 64 fully painted pages; late medieval binding decordated with silver niello plaques, 6 1/8 x 4 3/8 inches (15.5 x 11 cm) © THE ARTISTS AND LUHRING AUGUSTINE. 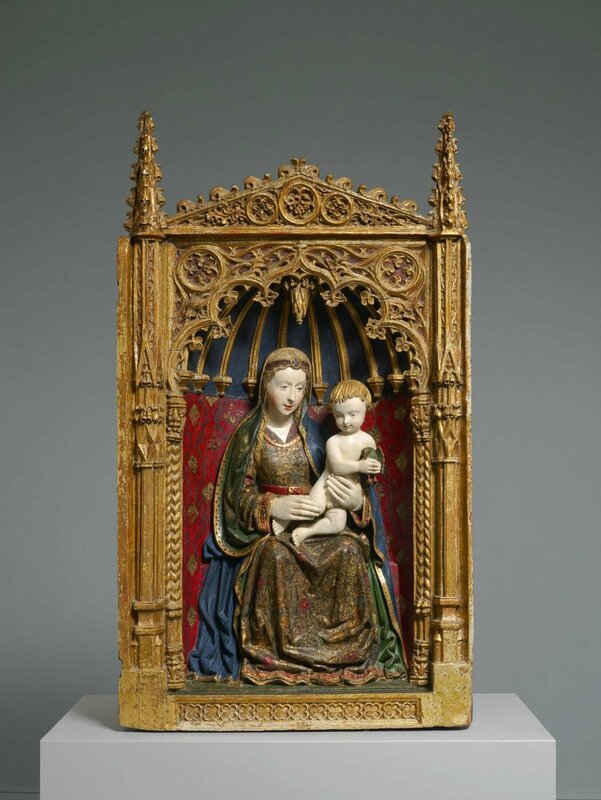 German or Southern Netherlandish Master, The Virgin and Child, Southern Germany, c. 1480. Oil and gilding on walnut panel. Diameter (panel): 17 inches (43.2 cm). Diameter (painted surface): 14 3/8 inches (36.5 cm) © THE ARTISTS AND LUHRING AUGUSTINE. 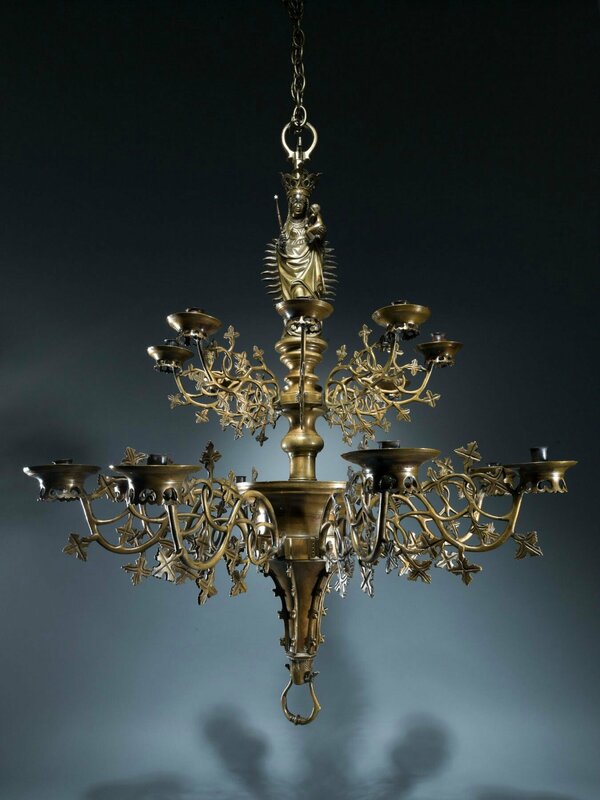 A two-tier chandelier with the Virgin and Child, Southern Netherlands, c. 1480-1520. Cast brass with incised decoration, 41 x 32 5/8 x 32 5/8 inches (104.1 x 82.9 x 82.9 cm) © THE ARTISTS AND LUHRING AUGUSTINE. 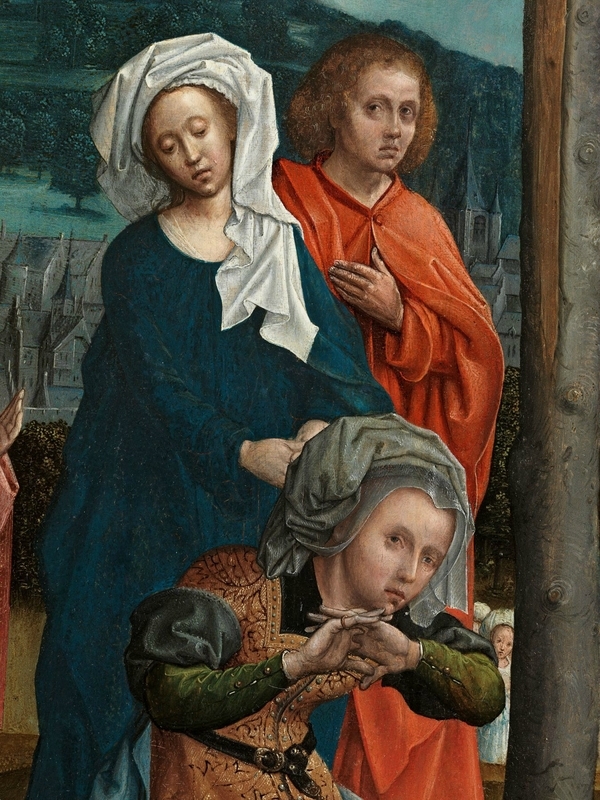 Workshop of Gil de Siloé (c. 1440-1501) and Diego de la Cruz (fl. 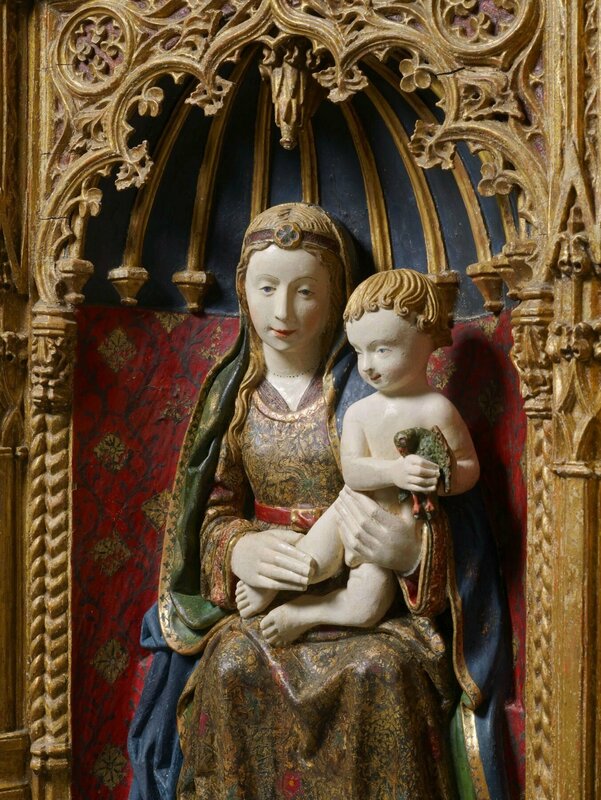 1482-1500), A gilded shrine showing the Virgin and Child, Burgos, Castile, Spain, c. 1490-1500. 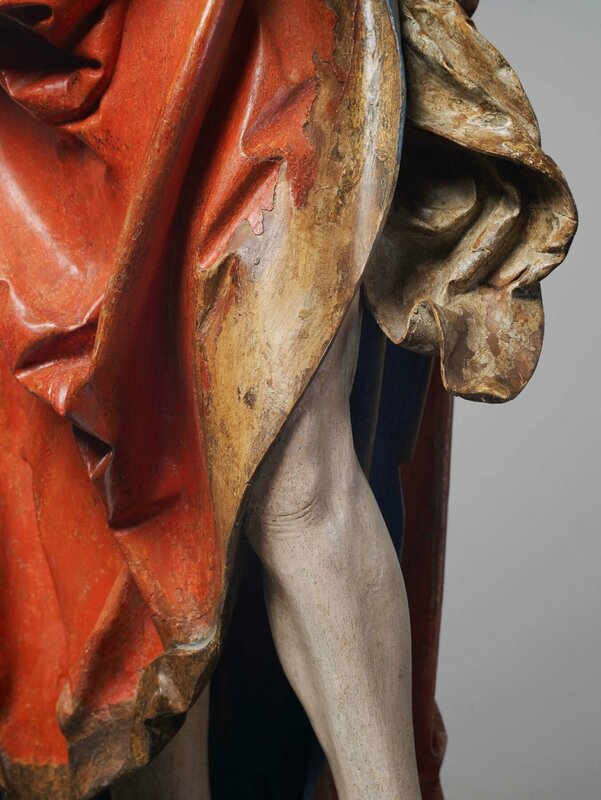 Softwood with polychromy, gilding, and pressed gesso decoration, 49 1/4 x 28 inches (125 x 71 cm) © THE ARTISTS AND LUHRING AUGUSTINE. 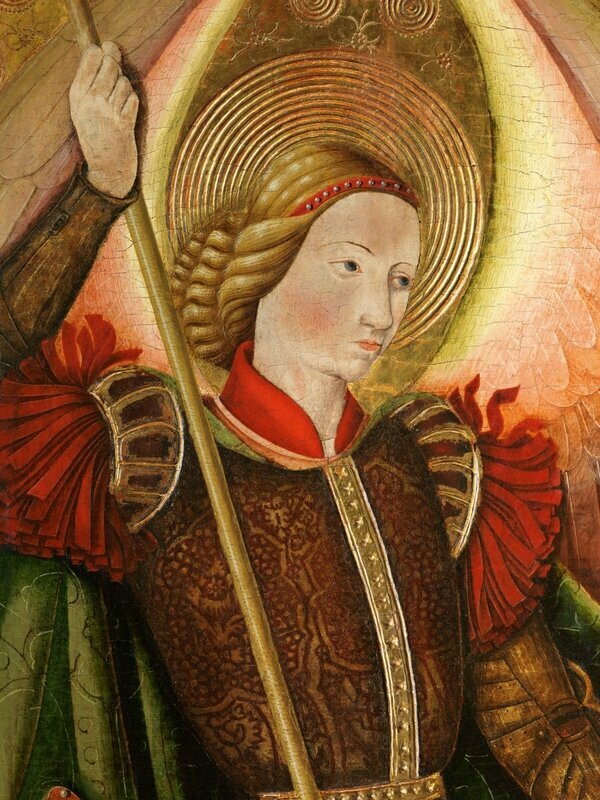 The Master of the Magdalene Legend (fl. 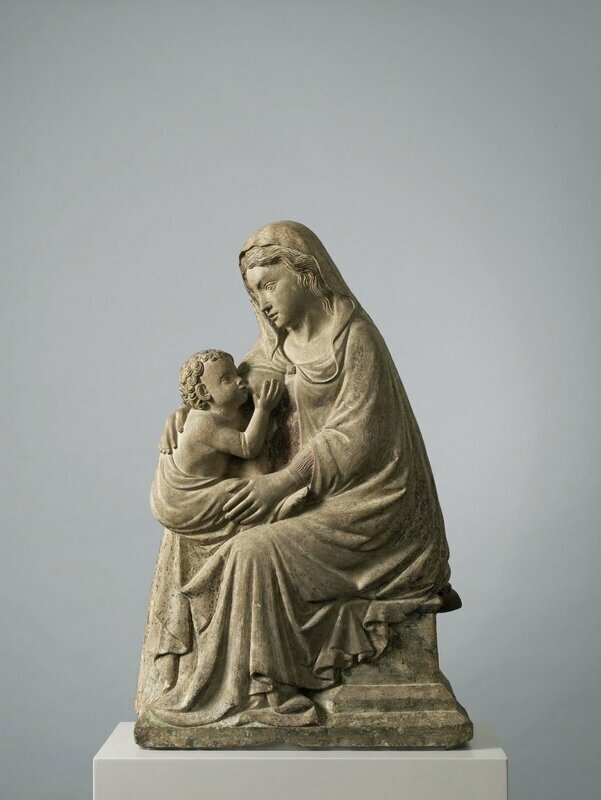 c. 1490-c. 1540), The Virgin and Child, Brussels, c. 1495-1505. Oil and gilding on oak panel, 16 3/4 x 12 1/4 x 1 1/8 inches (42.5 x 31.1 x 2.9 cm) © THE ARTISTS AND LUHRING AUGUSTINE. 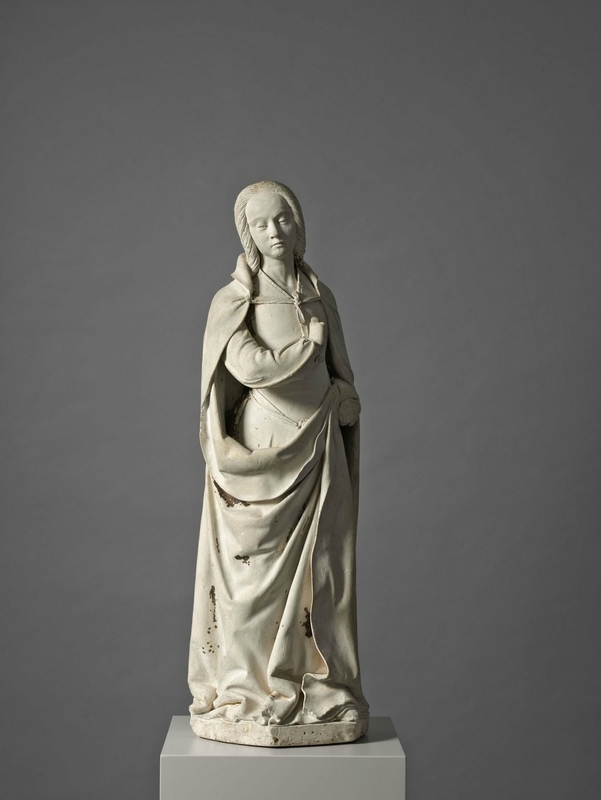 Guillaume Regnault (c. 1450-1530, attributed), The Virgin Annunciate, Tours, France, c. 1510-20. White limestone with traces of polychromy, 38 x 12 x 9 1/2 inches (96.5 x 33 x 24 cm) © THE ARTISTS AND LUHRING AUGUSTINE. 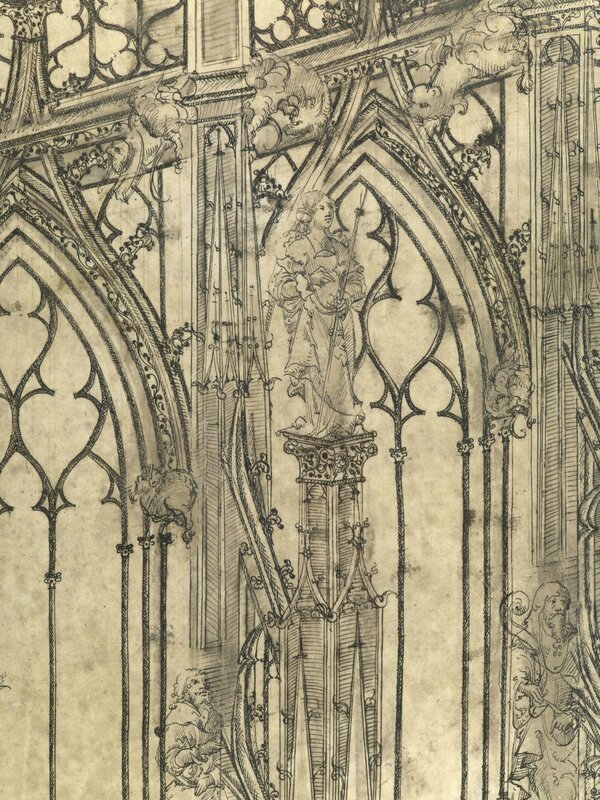 Roulland le Roux (active c. 1500-20) and Pierre des Aubeaux (active 1511-23), A monumental drawing for the crossing tower of Rouen Cathedral, presented to the Cathedral Chapter on March 8th, 1516, Rouen, France. 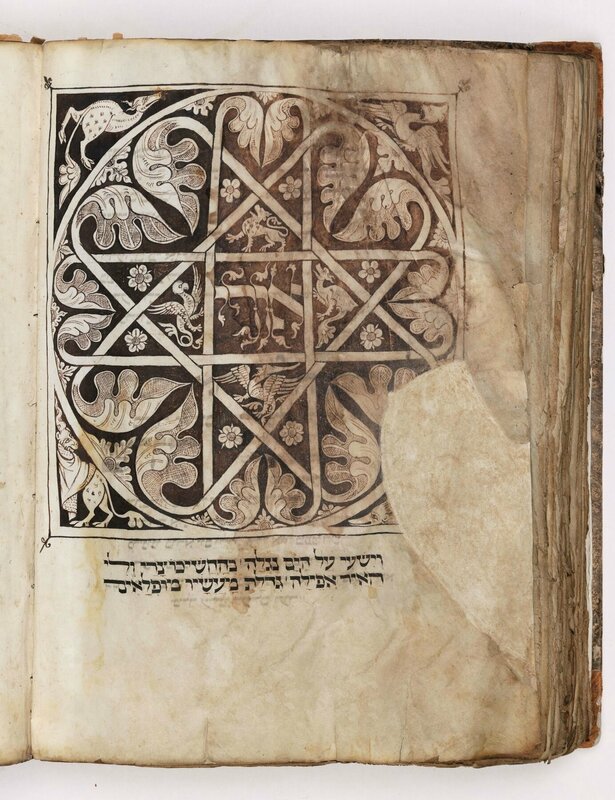 Pen and ink with stylus and compass marks on parchment attached to a later wooden spool, 133 7/8 x 25 3/8 inches (340 x 64.5 cm) © THE ARTISTS AND LUHRING AUGUSTINE. 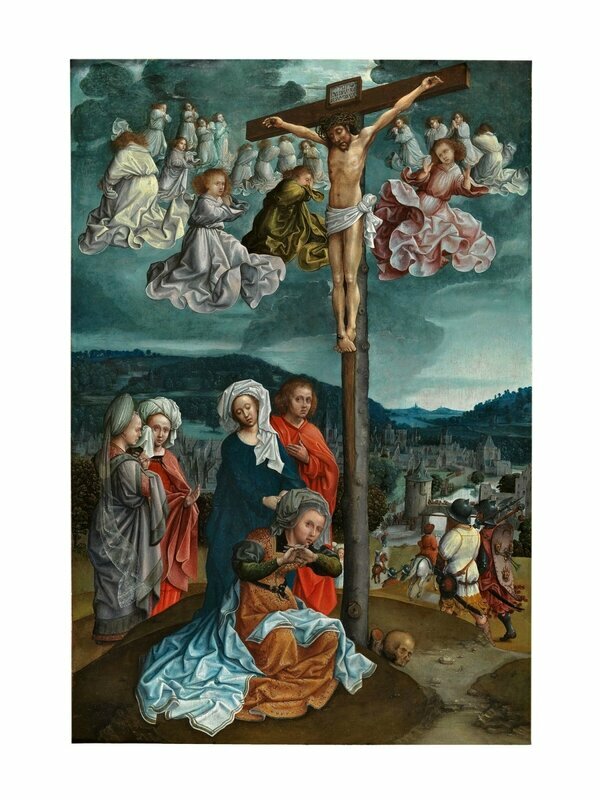 The Crucifixion, Bruges, Southern Netherlands, c. 1515-20. Oil on oak panel, 33 3/4 x 22 7/8 inches (85.8 x 58.1 cm) © THE ARTISTS AND LUHRING AUGUSTINE. Andreas Frosch (fl. 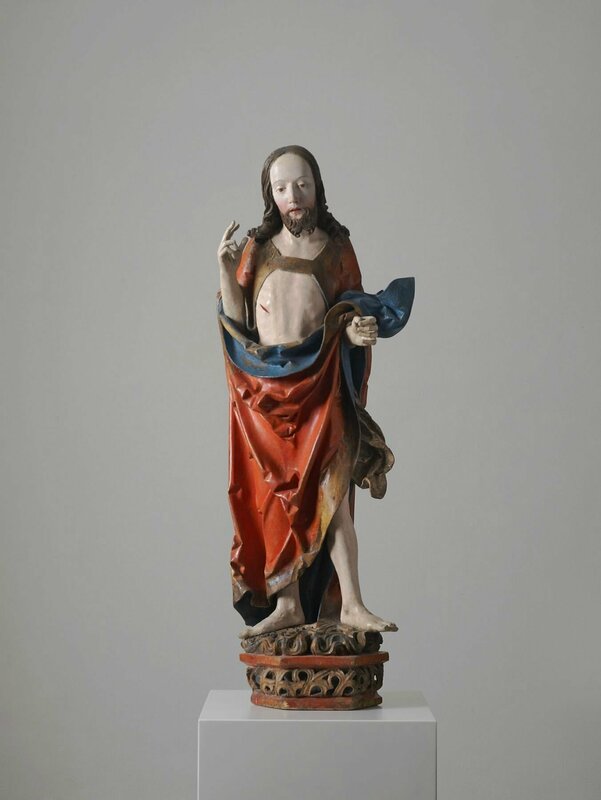 c. 1517), The Risen Christ, Donauwörth, Bavaria, Germany, c. 1520. Limewood with much original polychromy, 49 1/4 x 7 1/8 x 12 1/4 inches (125 x 18 x 31 cm) © THE ARTISTS AND LUHRING AUGUSTINE. 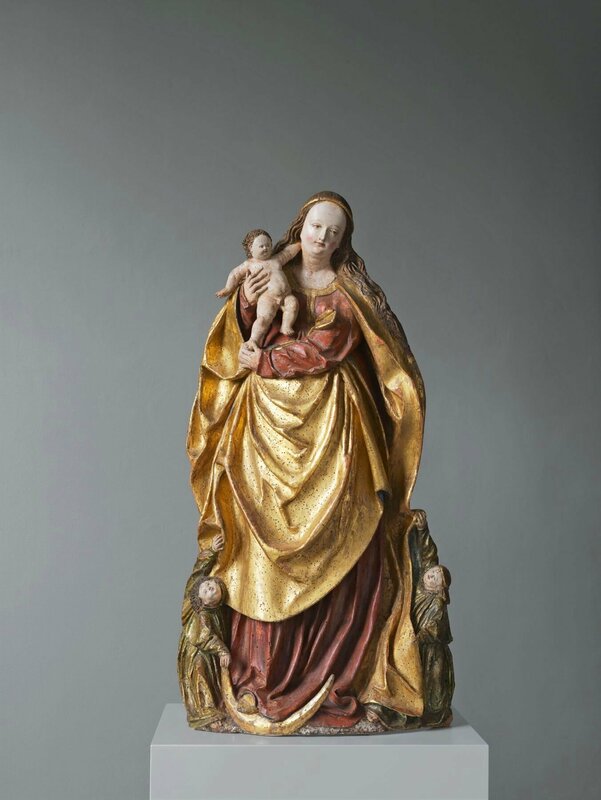 Virgin and Child with Angels, Lower Bavaria, c. 1520. 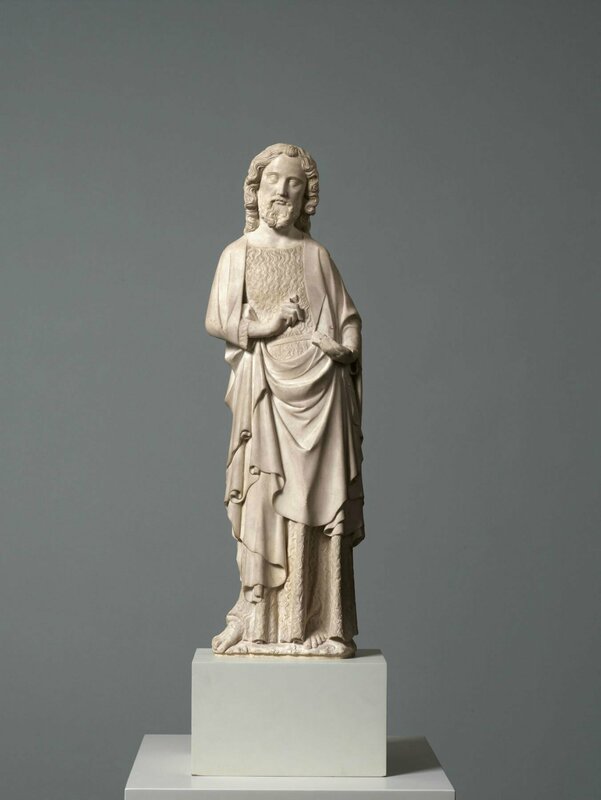 Gilt and polychromed limewood, 41 3/8 x 22 7/8 x 10 1/4 inches (105 x 58 x 26 cm) © THE ARTISTS AND LUHRING AUGUSTINE. 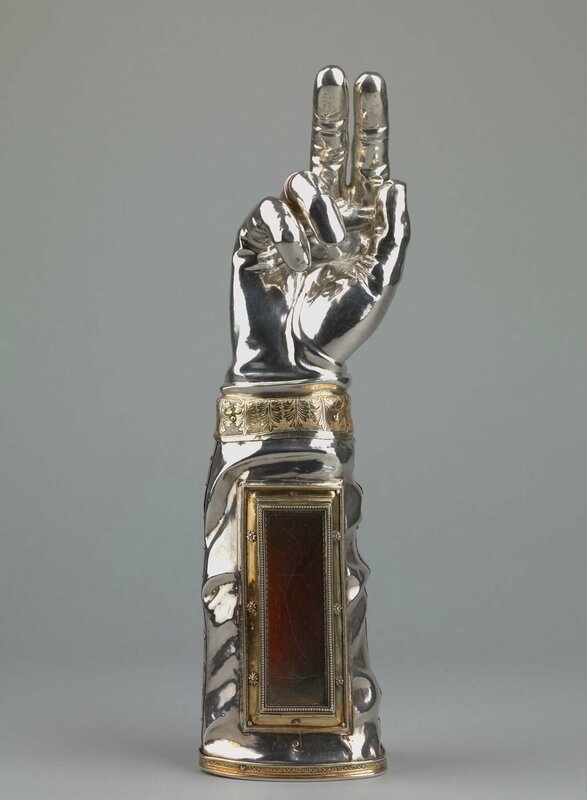 Jean Mamerot (active Auxerre, 1535-after 1568), An arm reliquary of a bishop saint, Auxerre, France, c. 1535. 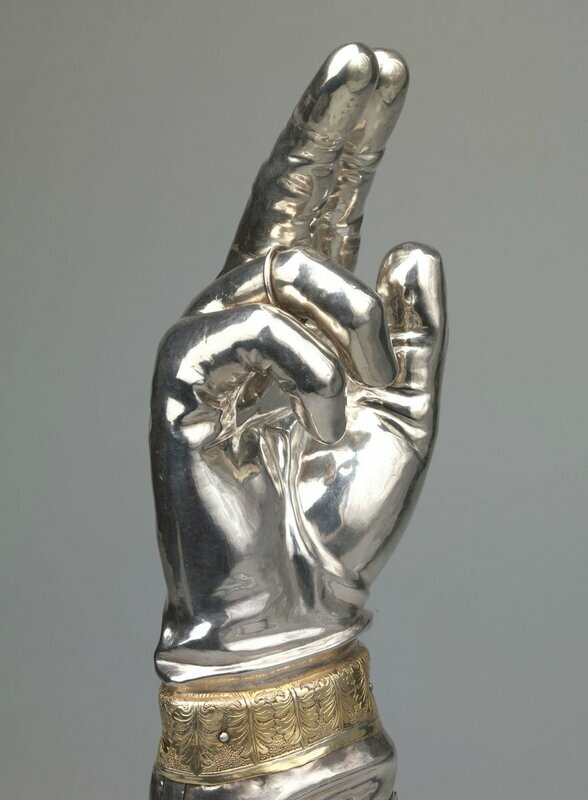 Silver, silver-gilt, and glass over a wooden core, 14 7/8 x 4 3/4 x 3 inches (37.7 x 12 x 7.5 cm) © THE ARTISTS AND LUHRING AUGUSTINE.